Indra credits the mentoring she received from people around her for helping her break glass ceilings in business. See more positive examples of great mentoring relationships at Top 25 mentoring relationships in history. And find also some more good arguments Why Mentors Matter: A summary of 30 years of research in the blog from Lauren Pytel. Mentoring just makes good business sense. For example, a Deloitte 2016 study pointed out: employees, specifically millennials, who ended up staying with their organizations for more than five years were twice as likely to have a mentor (68 percent) than not (32 percent)1, and according to Bersin by Deloitte, coaching and mentoring are the most valuable practices to be developed in a company2. However developing and managing mentoring programs is complicated. Often times it involves matching mentors and mentees manually which can be time-consuming and inexact3, and typically mentoring is a separate program outside of the overall talent development process4. But it shouldn’t be this way. 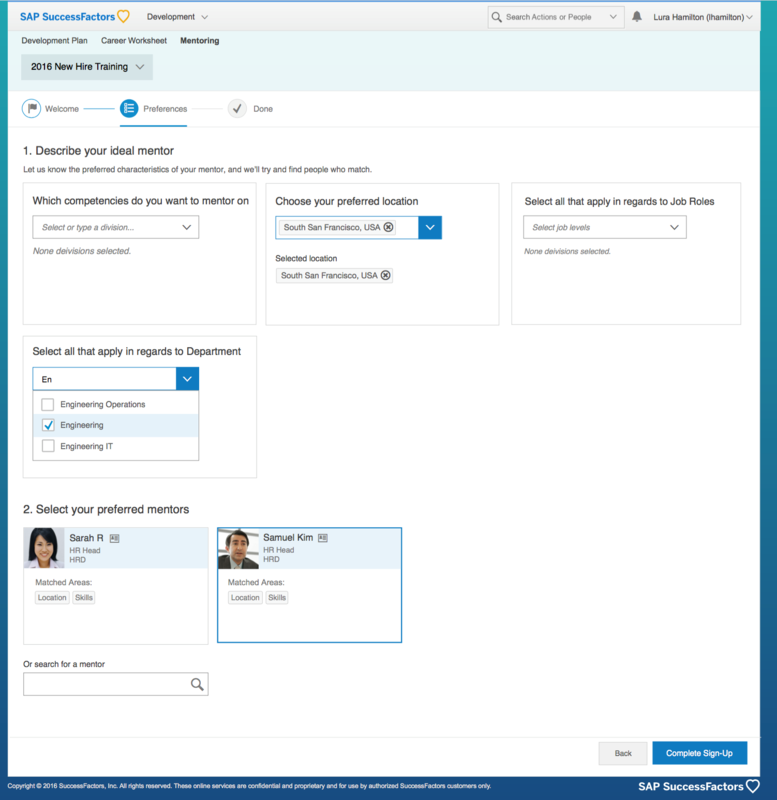 Whether you’re looking to elevate an existing mentoring program or implement one for the very first time, SAP SuccessFactors can help you optimize mentoring at your organization with a solution that is comprehensive, intelligent and continuous. We help simplify mentoring and increase employee engagement by removing the historically manual, intensive administrative work around mentoring programs with a comprehensive solution. Plus, unlike other tools, we provide a seamless experience between mentoring and other talent management processes and programs. Set up perfect matching of mentors and mentees. Reduce time and effort to find the perfect fit. Recommendations are based on criteria such as skills, competencies, location or preferences, and our intelligent matching provide ideal employee matches, saving you weeks, even months of manual effort. Our solution also offers administrators and participants simple-to-use tools to set up and monitor mentoring programs efficiently and effortlessly. Define the mentoring program details with description and control dates. Add mentors and mentees to the program individually or by using dynamic groups. 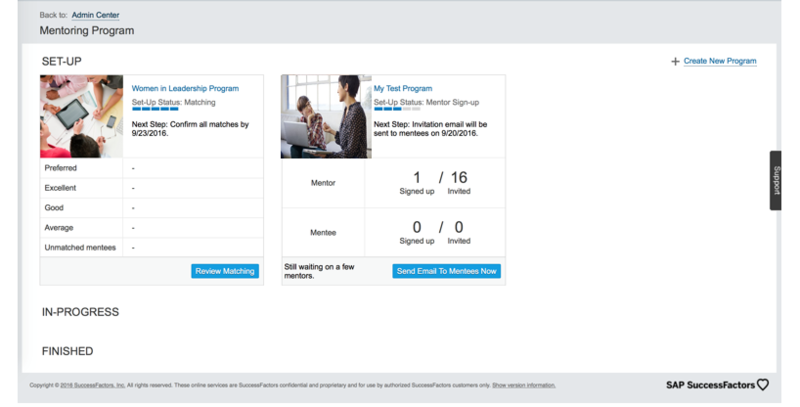 Generate sign-up forms and invite mentors and mentees to their overview pages. From creating to managing to reporting, our solution does it all through easy-to-use wizards, collaboration tools and dashboards. 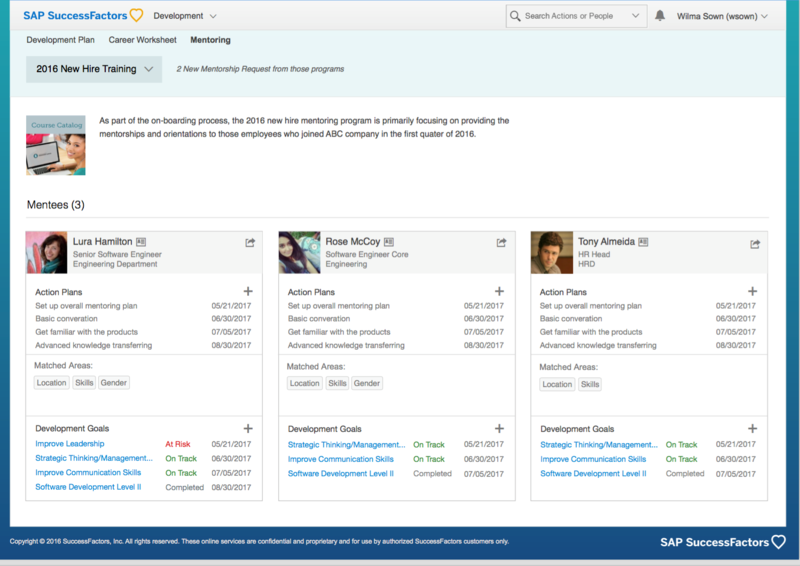 As part of the SAP SuccessFactors Succession & Development solution, Mentoring has all the benefits of being part of our HCM suite to support continuous and seamless talent processes, which is not available in point product solutions. 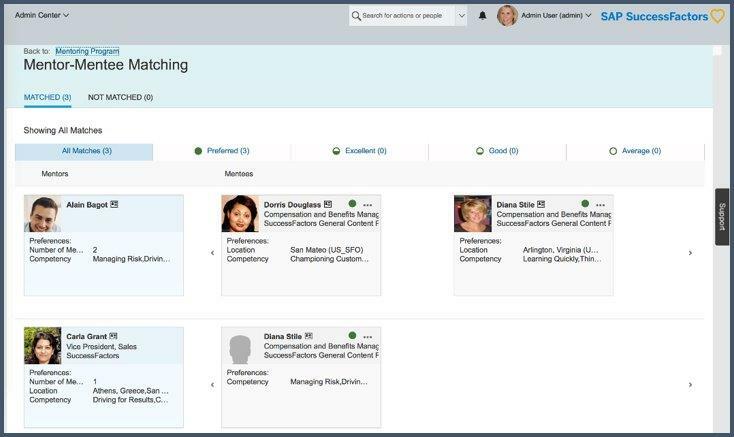 Get to know more about the power of our new innovative mentoring capabilities within SAP SuccessFactors Succession & Development in the Q4 2016 release highlights blog and video, as well as at our SuccessConnect 2016 event in Vienna. Plus, don’t forget to check out the latest report from Gartner, where SAP SuccessFactors received the highest score in two use cases in the Critical Capabilities Report for Cloud HCM Suites for Large Global Enterprises and European Headquartered Midmarket organizations. Happy reading! very glad SuccessFactors adds that functionality. Although I am a fan of all kinds of digital learning my most intense personal developments came either from learning by doing – or coaching and mentoring. Mentoring is one of the most powerful personal develpment methods – and i think many customers can benefit from that.